Self-described as ‘copy rock’, Teenage Riot peaked people’s interests as the 7-piece launched into their opening number ‘Cigarette Song’. Walls of feedback amongst a haze of cymbals and percussion swiftly gave way to the soft synth sound of Sabina Wong and clean picked guitars in the ilk of Nirvana from Lam Hood and Ling Ling Ling. This setting was merely brief though, as the full band soon kicked in to the full 90’s shoegaze sounds of Slowdive, and even elements of Suede. There were close harmonies in the choruses from singers Freakiyo and Porpor Channel, but they were fighting to be heard above the empathic instrumentals. The vocals were much crisper in ‘Wag Jeng’. A dry signal 80’s synth led proceedings before the rolling and ever-changing drums from Samuelccw set the backdrop for crunchy 7th chords reminiscent of Ride or Supergrass. The aggressive descent of the mid-section saw Freakiyo and Porpor become far more animated, jumping around aimlessly, whilst the others rocked away. ‘I Will Be Whatever’ drew comparisons to My Bloody Valentine with feverishly grungey guitar work over a steady rock beat. Despite the grit and angst on display, the rhythm guitar completely dwarfed the mix for most of the song. Balance was restored though as the lead guitar cut through with a sweetly repeated phrase over the long instrumental ending. Sadly, due to one component being out of place, it felt as if a strong song had been lost. Swirling guitars took the centre stage in ‘Laika’, with ascending lines revolving around a simple but catchy bass riff from Yanyan Pang. It offered the most intoxicating and memorable riff of the set, while Freakiyo and Porpor barked over the top to add to the Sonic Youth punch. ‘Movement’ meanwhile had a beautiful dynamic range, with a melodic Pulp-style chorus, and featured a phase shifting guitar solo which added a dash of Jonny Greenwood to the mix. Sweeping vocal ‘ahh’s and softly picked guitars gave a dream-like feel after the breakdown, with bold piano chords, before vamping back up into a Post-rock and shoegaze onslaught enveloping the crowd. Closer ‘New Romance’ centred on a dance beat and sparkly synth line, as well as scurrying arpeggio lines from bass and guitars. While it brought the set to a tight, cohesive end, it felt slightly underwhelming in comparison to the previous track. Nevertheless, Teenage Riot melded together a string of influences to create a compelling and memorable set of songs. If you have anything to say about Teenage Riot being a pastiche, they’re already way ahead of you. Performing a style of music heavily indebted to 90s guitar bands – a sound they’ve self-dubbed “copy rock” – the highly self-aware band makes no apologies for sounding like a tasting menu of overt influences. Though there’s no need to apologise: their Girls With Guitars set was one of the most uplifting shows Hong Kong has seen this year. 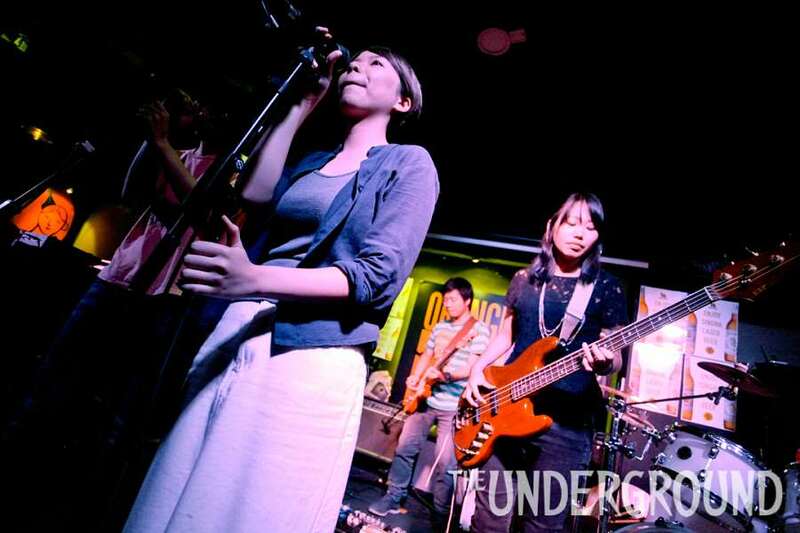 In a group formed of multiple other HK bands, the equally unassuming singers PorPor Channel and Freakiyo Yiu Wai Tung share vocal responsibilities. Seven members isn’t an easy number of musicians to coordinate live, but the show was tight and well-rehearsed. The guitars were fuzzy and haphazard when they needed to be, while the rhythms and synths sliced through to skin-tingling effect. The male and female voices – hers high and expressive, his flat and monotone – evoked the same duality heard in Asobi Seksu’s career, particularly when layered over walls of distorted sound. The sunny riff of Book of Face gave the track a Fleetwood Mac quality, while Trash From Your Heart had more of the happy melody/sad lyrics dichotomy of Travis. Keyboardist Sabina Wong was the band’s secret weapon. She remained stoically and unobtrusively focused on the keys throughout the show, yet her shrill synth melodies formed the indelible backbone of each song. Together, guitarists Lam Hood and Ling Ling Ling would pull the starter rope to create tidal waves of shoegaze noise, before reigning in the MBV-scale fuzz with rambling, cleanly-picked melodies. Yanyan Pang’s basslines were beautifully intricate, while Samuel Cheung’s thoughtful drums gave the delicate songs room to breathe. An impressive attention to stage craft culminated with both singers dropping their mics on last song Driving in A Nice Car and hopping off the stage to watch the other players reach a blistering crescendo finale. Rumbling rhythms, roaring guitars and screaming synths gave the ending the kind of end-of-the-world feel as Radiohead’s Blow Out. Arty and articulate, Teenage Riot owe a lot to their stateside namesake, yet ironically they’re one of the most exciting, refreshing bands HK currently has to offer.